WASHINGTON CITY — Two people were transported to the hospital after a tank came off a truck and struck a motorcycle Friday afternoon. At 2:30 p.m. officers and emergency personnel were dispatched to a crash on Buena Vista Boulevard near the corner of Calle Del Sol involving a white work truck pulling a trailer and a black motorcycle carrying two riders, with initial reports indicating that fluid was spilling across the roadway. Upon arrival, emergency medical personnel found two injured individuals, a passenger in the pickup and one of the riders on the motorcycle. Both were transported to Dixie Regional Medical Center in St. George for evaluation and treatment, Washington City Police Chief Jim Keith said. “The injuries that both sustained appeared to be nonlife-threatening,” Keith added. Firefighters from Washington City Fire Department also responded to address the spilled fluid, which Keith said turned out to be a nonhazardous weedkiller that posed no danger to the environment. At the time of the crash, the pickup truck was heading east on West Buena Vista Boulevard, while the motorcycle was westbound. 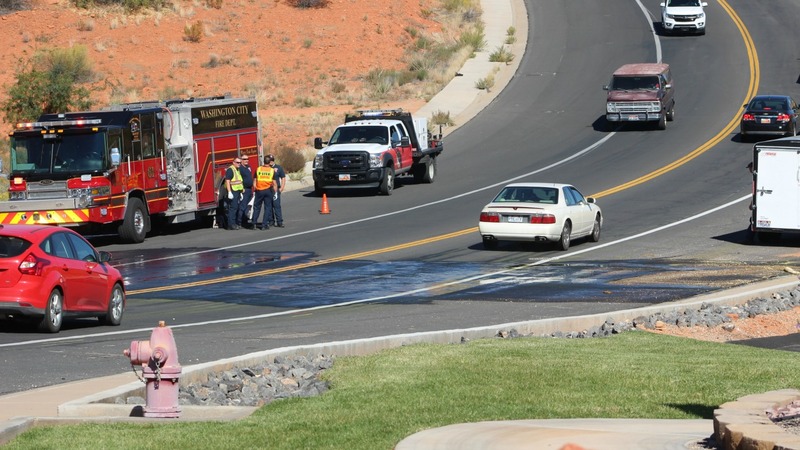 As the truck came around a curve at the bottom of the hill, a small tank came loose from the truck and hit the roadway before it bounced up and struck the motorcycle as it passed the truck, causing the crash. 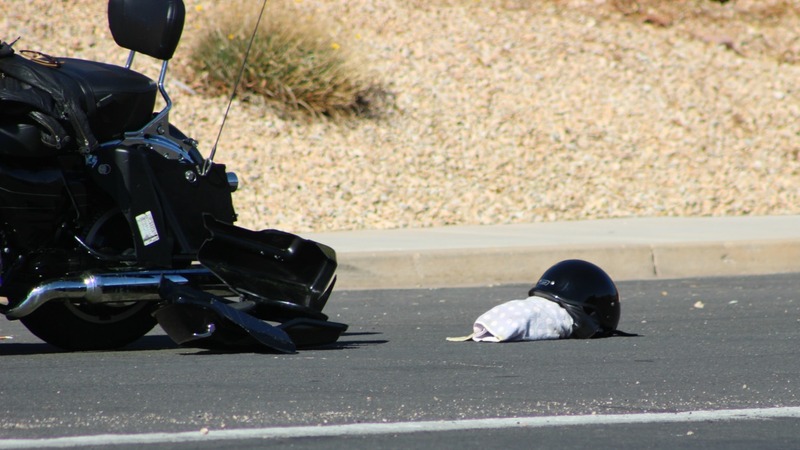 The motorcycle was rendered inoperable in the crash and was towed from the scene, while the pickup truck and trailer sustained minimal damage and remained operational. The incident is still under investigation, and no citations have been issued at the time of this report. This report is based on statements from police and may not contain the full scope of findings. Posted in Local, NewsTagged Accident, crash, Injury crash, motorcycle crash, motorcycle versus truck, truck trailer, washington city, Washington City Police Dept. “The incident is still under investigation, and no citations have been issued at the time of this report.” What’s to investigate??? The truck driver failed to secure a load and should be cited for; unsafe/unsecured load, and spilling a load on a highway, Pretty simple, but then again, this is Utah. I wonder how the passenger in the truck was injured? The one of the occupants of the motorcycle slip and fall on him? But the motorcyclist was apparently injured in the crash. And why would he punch the passenger’s lights out. Seems to me that he would have gone after the driver instead. Things just get curiouser and curiouser here in Dixie. Just wait till MJ is legalized US wide like Canada. Beaucoup jargon!